FILE - Cook County Sheriff police officers in Chicago, Illinois search a vehicle and a woman at street stop in the city's Austin neighborhood, September 9, 2015. On its first day back at work since Justice Antonin Scalia's unexpected death, the U.S. Supreme Court plunged into a case that could profoundly influence police behavior and alter the increasingly tense relationship between law enforcement and the public in high-crime urban areas. The eight remaining justices appeared divided along familiar ideological lines, raising the specter of what some predict could be a number of 4-4 votes without Scalia. At issue in this case, Utah v. Strieff, is whether courts can admit evidence obtained in a police search based on an earlier arrest warrant that is discovered only after a suspect is detained without probable cause. The justices heard an appeal filed by Utah officials of a ruling by the state's top court in favor of Edward Strieff, who was convicted in 2006 of methamphetamine possession and a related drug charge after his vehicle was stopped by police in Salt Lake City. The state Supreme Court ruled that Strieff's rights under the U.S. Constitution's Fourth Amendment were violated because although there was a warrant issued for his arrest at the time of the search — for a minor traffic violation — the police officer did not know that when he stopped Strieff's vehicle. 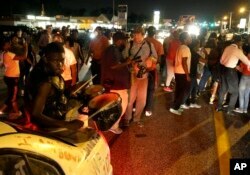 FILE - Protesters gather during a demonstration in Ferguson, Missouri, Aug. 11, 2015. Justice Sonia Sotomayor linked the Utah v. Strieff case to heavy-handed police tactics in minority communities like Ferguson. That concerned Justice Sonia Sotomayor, who linked the Strieff case to heavy-handed police tactics in minority communities like Ferguson, Missouri — the St. Louis suburb where Michael Brown, an unarmed black teenager, was shot and killed in August 2014 by a white police officer during a street confrontation. The shooting prompted protests that shook the area for weeks. "If you have a town like Ferguson, where 80 percent of the residents have [minor] traffic warrants out, there may be a very good incentive for just standing on the street corner and asking every citizen, give me your ID," Sotomayor said. "What stops us from becoming a police state?" she asked Utah Solicitor General Tyler Green, who conceded that Strieff's Fourth Amendment protections were violated. Joan Watt, representing Strieff, argued that the arresting officer lacked reasonable cause to stop him, because the officer only saw him coming out of a house under surveillance for drug activity, but did not see him enter or do anything illegal. But John Bash, assistant to the solicitor general of the U.S. Department of Justice, countered that any taint on the evidence secured via the illegal stop was diminished because the arrest was not a flagrant violation of the Fourth Amendment and falls under a commonly cited exception to its protections. Bash said the arresting officer, Detective Douglas Fackrell, acted in good faith and had reasonable cause to stop Strieff based on what he observed going on at the house. Fackrell "saw short-term traffic that was consistent in his experience and expertise with drug activity. And then someone walked out of the house ... I mean, this wasn't a pizza deliveryman," Bash said. Thirty other states — including Michigan, Oregon, Kansas, Florida and Hawaii — agreed. They filed an Amicus Brief in support of Utah, arguing that suppressing evidence found in such circumstances would neuter the power of legal arrest warrants and frustrate police officers' ability to perform their duties. But Justice Elena Kagan countered that creating a new standard for Fourth Amendment protections would change police incentives dramatically in communities where large numbers of people have arrest warrants. "In these very heavily policed areas — I mean, I was staggered by the number of arrest warrants that are out on people," Kagan said. "So it's a significant possibility that you're going to find an arrest warrant and be able to admit whatever drugs or guns or whatever it is you find," she said. Chief Justice John Roberts and Justice Samuel Alito appeared unmoved, arguing that law enforcement officers have many reasons to run warrant checks, including fears for their personal safety after traffic stops. "Utah's rule would have an overwhelming impact that would create a powerful incentive for police officers to walk up to people on the street and simply stop them," she answered. The court is expected to issue a decision on the case before the end of its term in June.